Back row 1st and 2nd - Ross Dalgarno (senior) and John Cameron - 7th ? Calder? Front row 1st Munro Fraser. Nice to see this photo : Yes Annabel Shaw (our Mam) is in the 2nd Back Row fourth from the left. We do not have many photos of Mam in her younger days so this is a nice one to keep. Sadly Mam passed away 14/3/05. Happy memories. It was Justin Calder, and front row on the right might be one of the Mackenzies. The Calder is Donald Calder, Justin's older brother. I am not sure which class this is. It was either one up or one down on me, but it may be an amalgam of two classes as Jean Kyle and Munro Fraser were definately in my class, but I am not on it. 44 children seems overly large! Bottom right is Lawrence Mackenzie (Lol to his friends). There are two classes, possibly three, in this group. I can remember the names of most of the children and have enjoyed remembering them all. I am in the picture in the third row, behind Sud. 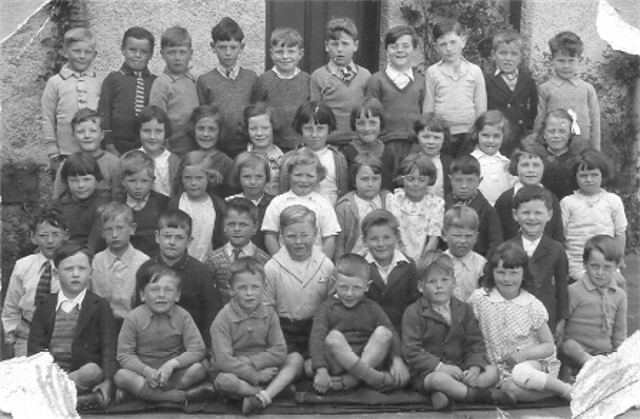 7th in the back row is my dad Donald Macrae Calder(Jocky). Sadly he passed away on 2nd Feb 1991. I love seeing old photos of him. Thank you.